I love the transformation, it is now beautiful!! Perfect! Glad you are giddy! The walkway is just lovely now! Beautiful facelift! The Little Red House walkway looks lovely and very welcoming! Your house's new walkway and steps look beautiful! Well worth the makeover, Mary. Wonderful transformation! And just in time for the holidays. I'm sure it feels sooo good! Oh it looks lovely! What a nice and welcoming walk. Hooray for sure! It's a wonderful improvement. We are talking about changing a walkway here, too. Have a great week Mary! I do know what you mean. We cleaned out our garage the other day and everytime I go out there it just tickles me so. Things look good there Mary. The Dear Little Red House looks more dear. Your new walkway and steps turned out really nice. Don't worry about going on about something like this - it's these changes to our home that give us such a lift. Thanks for sharing it too. 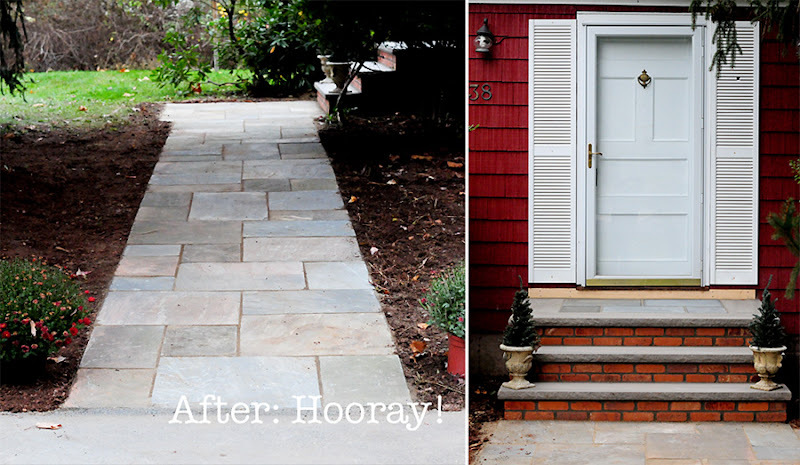 Wonderful transformation and the perfect pathway leading up to your charming home! Thanks for hosting Mary. Good for you, and your house, Mary! Every now and then you need a little 'lift'. I really like what you had done. Much more inviting thats for sure! It looks wonderful, Mary. 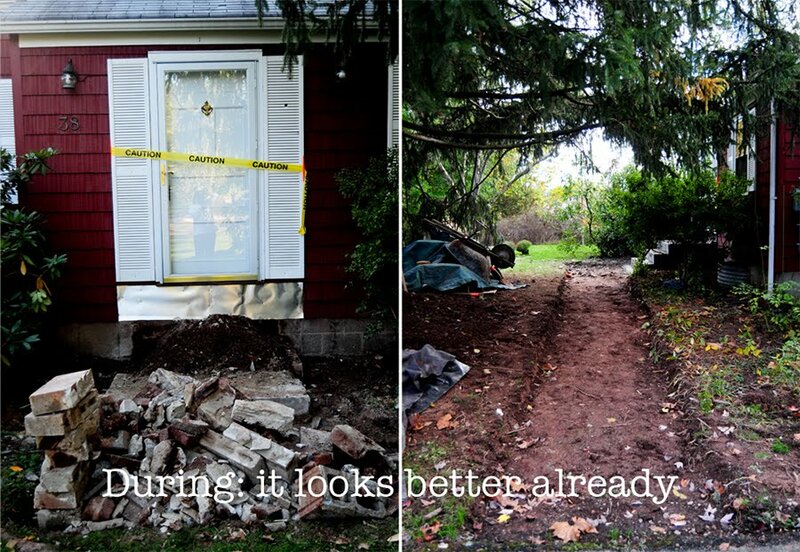 I know what it's like to be ecstatic about every little thing that gets righted with a house. Must make you grin every time you see it. What's next? Thanks for hosting Mosaic Monday. I'm glad you included the before photos of your facelift. You did a fantastic job with your new walkway and steps. Working on a house can be so satisfying. You look at the results every day. I think you've done a great job! First time comment long time follower. It's beautiful makes me want to chalk a hopscotch on that path ! This is a wonderful facelift...love your choice of materials!!! Have a beautiful week! Mary, this looks fantastic! I definitely know how good it feels to accomplish something BIG on the "to do" list. Great job! It's very perfect and looks wonderful! Why, it looks just PERFECT. I have always thought it is so romantic that you live in the house your daddy built for his family. That is a fabulous transformation. I can fully understand why you'd be coming up with any excuse just to wander along the new path onto the new steps. What a treat for you! Every house of un certain age deserves a face lift! It's absolutely beautiful - love the square cut flagstone and the new treads on the stairs. I am a huge fan of your site. I rarely link any mosaics to your site, but I did so today. Yesterday I changed the whole template of my blog. For some reason, every time I try to submit a link back to your site, I get an error code. I don't know why. I've posted it on the google help forum. Just wanted you to know that I tried to link back. It looks great! 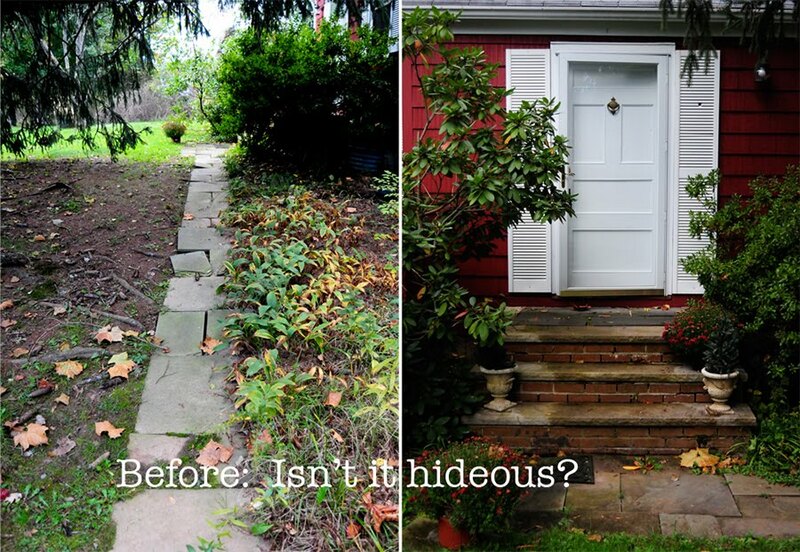 We so want to redo the front walks at our house too; we hope to have it done in spring! The steps are beautiful, and the pathway is just gorgeous. I want! It's beautiful! 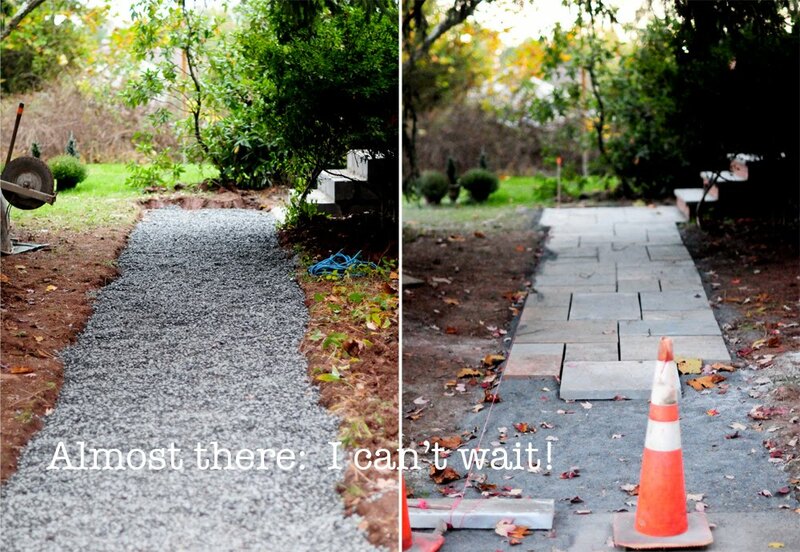 I'd love to walk up that new path to your door! Mary, I find nothing hideous in the "before"... maybe the path just a little narrow and wobbly, but charming nonetheless. Still I can see why you'd be elated to get the restoration done, and it does look lovely. PS> I seriously doubt that YOU need a facelift! I don't think it was hideous. It looks homey, cozy and well-loved to me. The transformation is lovely, tho. My front walk so needs a facelift too...maybe next year:) Love the end results! Oh, Mary, what wonderful before and after pictures. What a great transformation...Uh, facelift! Just changing a couple of things has made your little red house shine!! Although I must say that the little red house before was not horrible, expanding the walkway and adding new bricks and stones for the front steps, just makes it pop! Thanks for sharing!!!! Mary, it's wonderful! It's so funny but, some of the houses that you've shown - the gardens - actually, possibly, one of them was Bunny Williams' gardens - they've made me start to pester Tom for a patio/walkway just like this. I'd been admiring the patios that you've been showing us all summer. We could surely use a place to put chairs, where their legs won't sink into the sod. Ahh, don't you just love home improvements! It turned out wonderful, Mary. Hooray indeed, Mary! It looks wonderful!!! I can imagine how delighted you are to have such a beautiful upgrade to your entry. Now, can you please have whoever did it come right over to my house? We were going to do our entry steps this summer but ended up being away so much. Now another winter of broken, mossy, awful concrete steps. I missed Mosaic Monday last week because I had to work, so also missed your garden path and step makeover. Nice work! Looks great - time for some more plants along the path? I think I need to do some make-overs too!